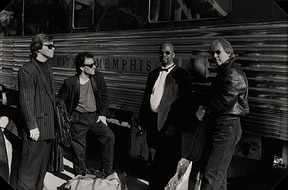 The Memphis All Stars have probably played more Tunica, Mississippi Casino shows than any other band - EVER! With such and extensive songlist that ranges from Oldies Classics to Stevie Wonder, and from Old Memphis to Motown, these guys are sure to please any crowd. They don't just play Tunica Casinos either. They play casinos all throughout the SouthEastern United States, private parties, receptions, reunions, and corporate events of all kinds. You might also catch them lending their talents as a support band for big name touring vocalists, or producing a new recording! Comprised of veteran musicians who have been playing in Memphis since the early 70's, their musicianship will fascinate you while you walk down a veritable musical memory lane of oldies, r&b, and blues. Their own CD Blues Train is available in stores and online, showing the laid back blues influence that drive the band! I Could Write A Book Harry Connick Jr. Please be patient to allow clips to download.